"This is the best calamari I've ever had," Jeff says to me suddenly. We're sharing the deep-fried calamari at Lemongrass on Bayview, a restaurant which specializes in Thai and Vietnamese cuisine. The calamari appetizer ($6.99) is served with the house special lemongrass ginger sauce, and the light, crispy coating adds crunch. 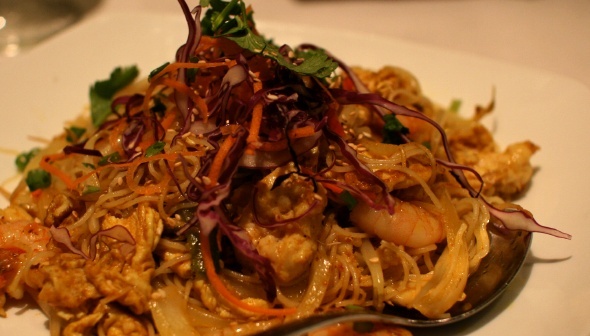 We've passed by Lemongrass Restaurant often on Bayview and have finally decided to check it out. The sparsely decorated interior is elegant yet not so upscale that we'd feel uncomfortable eating there in jeans. That's a big factor for us when choosing where to eat; neither of us likes getting dressed up for dining unless it's a special occasion. Both of us order from the Asian Pastas section, whose entrees range from $9.99 up to $12.99. I order the Saigon Deluxe ($9.99, pictured at bottom of page), a dish with chicken, shrimp, eggs and bean sprouts with rice-noodles stir-fried in smoked shrimp paste and soya sauce. Happily, it tastes just as good as it smells, flavourful and filling. Jeff orders the Traditional Pad Thai ($9.99): chicken, shrimp, eggs and bean sprouts with rice noodles stir-fried in tamarind (it says "tamarid" in the menu, but I'm assuming this is a typo) sauce with ground peanuts. 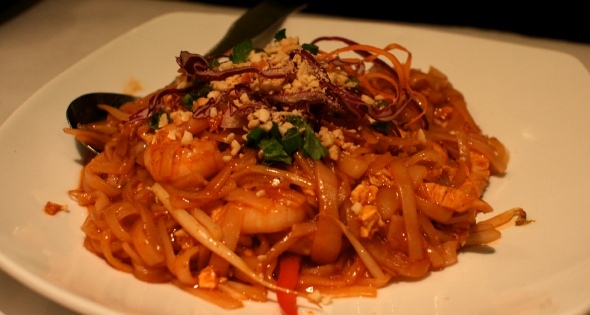 We both got hooked on pad thai at Golden Thai downtown years ago. In addition to its stir-fried dishes, the menu also has a wide range of wok dishes ($9.50-$14.99) as well as curries, noodle soups, salads, spring rolls. Quite a few vegetarian options are available, and you can ask the chef to add an extra kick if you prefer your food on the spicy side. If you're in the mood for a more upscale ($$) meal, try one of their signature dishes like their Tangy Tao Crab, Thai Spicy Peppercorn Crab, or Drunken Crab (speaking of Drunken, there's also Drunken Lobster and Drunken Garlic Shrimp), listed at "market price." You can find their lunch and dinner menus on their Web site , without prices. Their lunch specials include "create your own" combos, with choices in broth, soup and entrees. 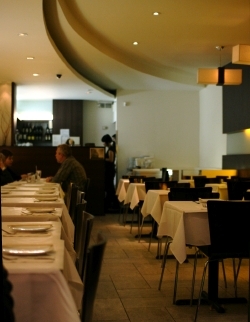 Lemongrass also has locations in the Clarica Centre (416-231-8288), Square One (905-270-THAI), and at 633 Silver Star Blvd. in Scarborough (416-321-3326). Hours (Bayview location): Mon-Sun 12pm-10pm.